The answer is that, as seen from our northern hemisphere, the ecliptic – the pathway of the moon and planets – sinks very low in the southern sky on autumn evenings. That is why the waxing crescent moon and the first quarter moon always loom low in the sky in September and October, as seen from this hemisphere. Have you been watching the waxing crescent moon at the same time for the last several evenings? If so, you – like Diana – would have noticed the evening crescent moon moving in more of a sideways than upward direction from day to day. That is always the case in early autumn. The view is in contrast to March – at a time near the spring equinox, when the ecliptic swings way overhead. In springtime, you will see the evening crescent moon traveling almost straight up from day to day. In springtime, you will also see first quarter moon close to overhead at dusk and nightfall. Look outside this evening. If your sky is clear, you will see the waxing crescent rather close to the horizon on this autumn evening. Tonight, the rather wide waxing crescent is low in your south to southwest sky at dusk and early evening. The moon will set in the southwest late this evening. At nightfall, you will see tonight’s moon residing beneath the Summer Triangle and in front of the constellation Sagittarius. 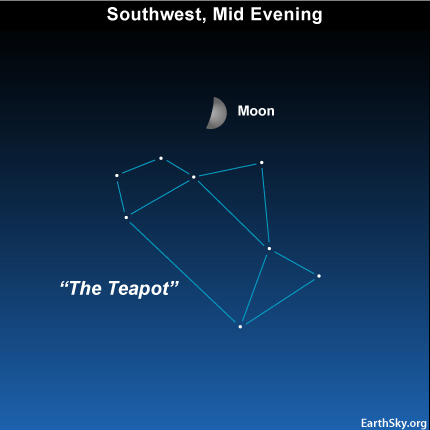 Despite the moonlit glare, you might spot the Teapot below (or south) of the moon. 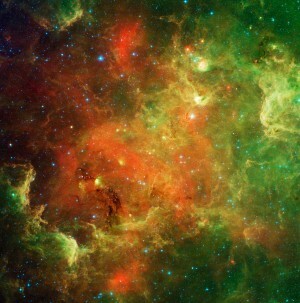 The Teapot is an asterism – a star pattern that is NOT a constellation. The Teapot makes up the western half of Sagittarius.